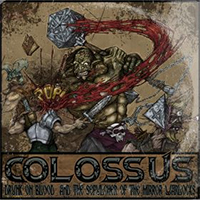 And ridiculous album name of the century goes to…Colossus. “The Mountain That Rides" is a much better name, it being the opener, and the band quickly launch into somehting that’s okay if not earth shattering. The arrangement is a little out at times but it does see a vaguely interesting chorus. Before I go on to the next I must note that it does sound a little like the sort of extra you get from a bigger name when they put out a fan disc with early demos. It’s intriguing to see what it might become in twenty years but not especially great just now. Unfortunately the rest of the tracks don’t really offer up much more than general curio pieces. They occasionally flirt with something better such as the instrumental middle to the catchily titled “A Year Later There’s Still Meat Left In The Skull" but it all feels too amateurish, like a good school band and little more.